Mood board: Now that half of the shows in Milan suspiciously resemble past creations invented by Alessandro Michele at Gucci, it’s a relief to see the designer has an endless source of tricks up his quirky little sleeves. His mood for Gucci is still maximal, the beat still odd-ball, the men still gender-bent and the workmanship still wafting in sky-high luxurious clouds. But somehow, it all still manages to look different. This season’s play with colour blocking had a distinctively 1970s feel: pink flood pants with lavender jackets or warm tobacco pants paired with a mint turtleneck, coupled with chinoiseries, patchworks and embroideries. 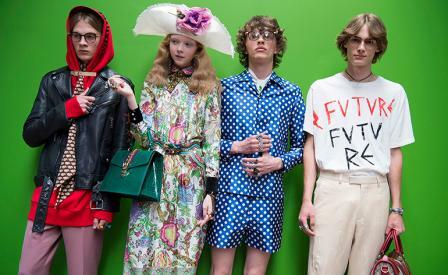 It gave us yet another fashion fest with a capital F, for full-on. Best in show: The craftsmanship at Gucci continues to dazzle nearly every piece in the collection. A boring white leather bomber jacket for example was set ablaze with an intricate green floral intarsia that appeared like wisteria growing like mad, while rich chinoiserie short suits were embroidered with lettering and worn with black lace granny socks.